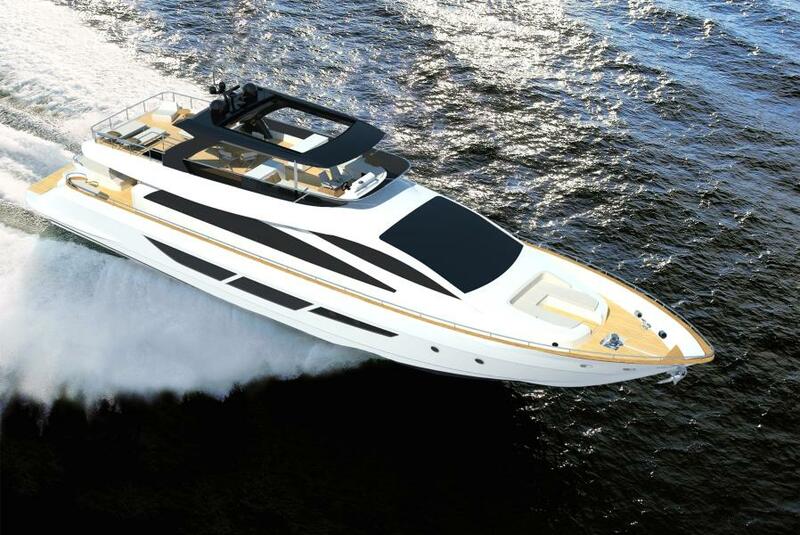 LIGHT BUT STRONG The brand new Amer 94 Twin offers the new concept of ultimate efficiency with no compromise in the luxury yacht experience. All of this while offering the best fuel economy in its class. New vessel and 5 year engine warranties apply. 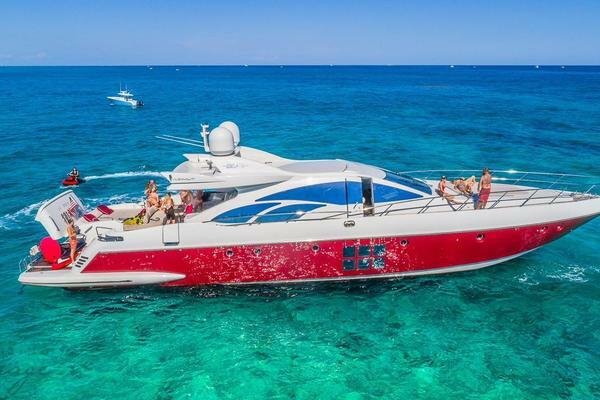 United Yacht Sales New Jersey would love to guide you through a personal showing of this 94' Permare Amer 94 Twin 2018. 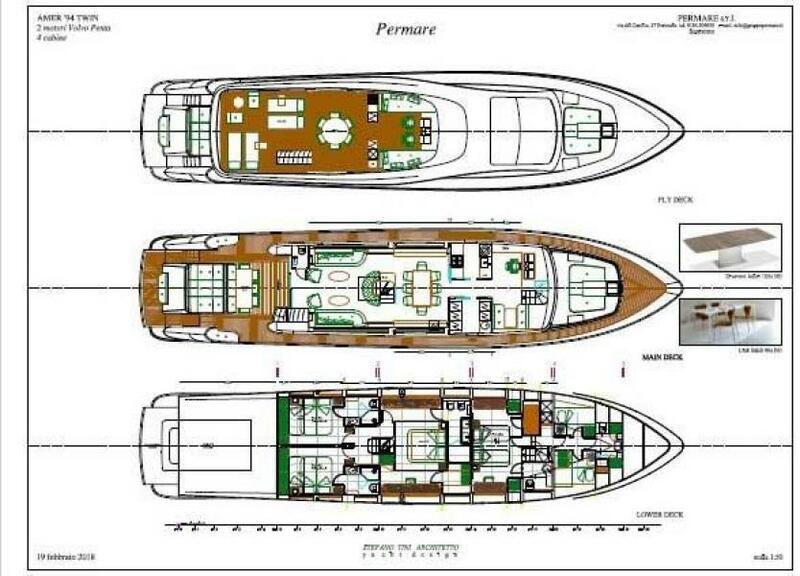 This yacht for sale is located in Sanremo Italy. For pricing details or a showing please contact us by filling out the form on this page and we will get back to you shortly! After much testing and experimentation, we have found that adopting the Volvo IPS system in our yacht, the diesel consumption is reduced significantly. As a result, we also expect to see much less air pollution. In our pursuit to excel our previous record performance of 3,5 liter per mile at economical cruise during displacement cruise. To obtain this result we have developed a new hull construction light but solid, using more carbon fiber and vacuum system to develop the lightest, but strongest hull possible. We used lithium batteries and three parallel variable speed generators in 380 Volt that will also provide a smarter AC power generation system that is not only more economical, but will perform better in overall efficiency. A gyrostabilizer that will not add drag to the yacht, and we will study in maniacal way the weight distribution on board. 5000 liters central structural tank and the brain new 2 x Ips 1350 Volvo Penta launched last year at Cannes Boat Show. The engine package is not only powerful, but light and in a compact package that will give us a much larger living space inside the yacht. 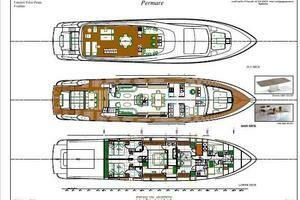 This allows for a 5 stateroom configuration. Economical cruise at displacement 1000 rpm at 9 knots speed with a large autonomy which will permit a non-stop navigation from Sanremo to Venice and no refuel. ( 1600 nautical miles autonomy) Cruise speed 23 +/- 1 knots 14 liters/nautical mile and autonomy for 350/360 miles Max speed 27 +/- 1 knots 15 liters/nautical mile and autonomy for 340/350 miles As you can notice both cruise and max speed have a similar consumption. We are investing as automotive and aeronautical fields in the weight saving research. Some examples just to givean idea of our investment: Using lithium batteries for each saved kg we pay additional € 150/kg Using carbon fiber for each saved kg we pay additional € 58/kg Using vacuum system each saved kg we pay additional € 7,4/kg Using three parallel variable speed generators each saved kg we pay additional €55/kg.